Located in the Funk Zone of Santa Barbara, Brass Bear Brewing is a husband and wife team who started brewing in 2009. Brass Bear Brewing opened in Feb 2016 and is located one block from the beach inside the Funk Zone of Santa Barbara, CA. We serve our high quality craft beer and rotating guest taps, wine, sparkling and cider. Our food consists of charcuterie boards, skewers of tritip, chicken, shrimp, occasionally shark, burgers and hot toasted sandwiches sourced from Santa Barbara and surrounding counties. The Brass Bear name came to be during a National Parks cross-country road trip from New York to California. At our favorite park, Glacier, we did backcountry camping (the kind where you sign your life away at The Ranger Station and all they do is arm you with a safety video and bear spray for protection). As ‘luck’ would have it, after 6 hours of hiking and seeing no one, we came face to face with a family of three Black Bears. The late afternoon sun hit the bears just perfectly and turned them to a beautiful brass color. They glanced our way and with a decisive grunt carried on. We agreed over dinner that night that this would be the perfect name for our own business one day, to remind us to face our fears and keep on trekking! 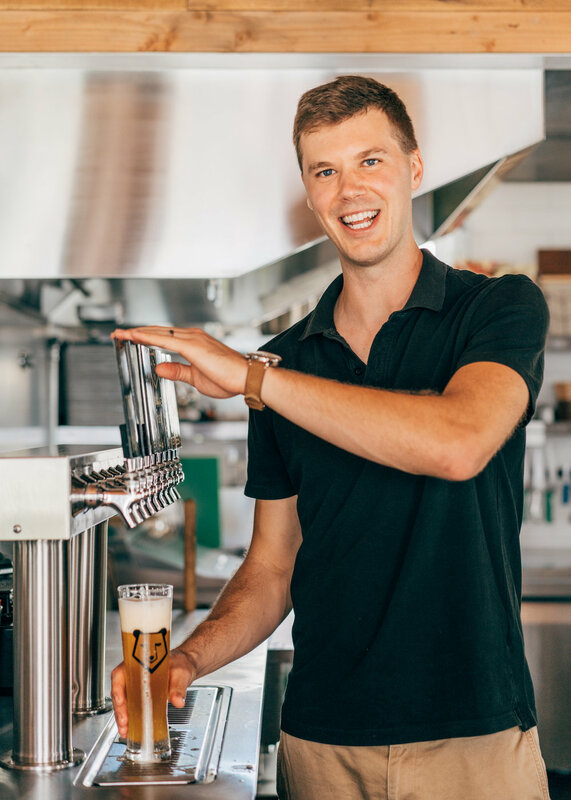 After Matt's first trip to California for Seth and Lindsay's wedding, a few months before opened Brass Bear Brewing, he expressed a little interest in making the move out west. Two months after Brass Bears open Matt received a call from Seth asking him make the move out west, ASAP! Lindsay had their first son, due any day at this point and needed a replacement. Before Seth could hang up the phone Matt put in his two weeks and marathoned across country with anything that fit in his car. In 3 days he pulled into the Brass Bear parking lot for the first team meeting and fit right in with the crew, 5 hours later Lindsay went into labor and the rest is history! Kaity, is Matt's Girlfriend who had never been to California before! Once Matt had talked to Seth he knew this would be asking a lot from Kaity, but sure enough with the same enthusiasm she was up for a new adventure. Kaity packed up her life and her dog and they hit the 3,054 mile long road ....With nothing but complete faith in Bass Bear Brewing & Matt. Went to junior high, high school and college here in Santa Barbara and worked for Channel Island Surfboards through high school and college. She left for 5 years to work in New York City as the International Visual Director of Massimo Dutti. NYC is where she met Seth her husband over a beer at a bar out with their roommates. Lindsay bought Seth a home brewing kit for their first Christmas together and to this day they still brew from some of those recipes. Seth is originally from Virginia but was working in New York City for Goldman Sachs for 7 years when he met Lindsay. After homebrewing together for a few years in their 500 square-foot apartment they decided to leave their jobs to travel for year doing “WWOOF”ing across Australia, New Zealand South Africa, and London. 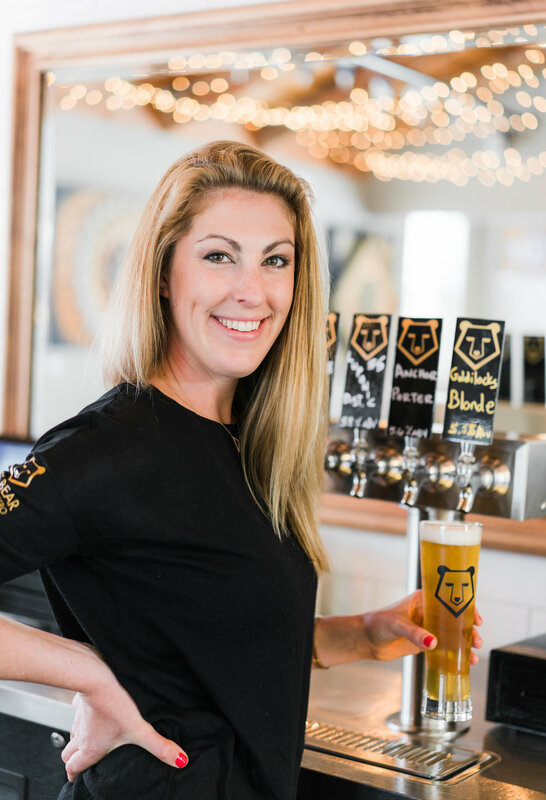 This is where they truly learned how to bring their talents and skills together in marketing and finance to create their business Brass Bear Brewing together. Is our right hand man in the kitchen and when he is not making marinades, he is making everyone laugh on stage. He is our host for Pop Up comedy shows here at Brass Bear, held every other Monday. Lindsay was 8 months pregnant when they opened their doors and worked in the kitchen till the day she went into labor with their baby boy William. Pop Up Comedy every other Monday night, Dinner Pairings; 4 course meal paired with beer or win. follow us on social media for those upcoming dates and sign up early as they will sell out fast! Our team loves to host and our size offers you very unique pricing! Please contact us at Info@brassbearbrewing.com with any questions about private events. Brass Bear has a supervised kid play area with toys and activities to help the parents enjoy a hot meal and a glass of beer or wine. its Simple but fun for all ages. We have a 3 year old son who we completely stopped taking to restaurants because it was such a challenge. One of us, if not both of us would end up eating cold food or just getting it to go. Sometimes you just need two minutes! !